All Kids Do This – When Should You Worry? Some of the most important character traits that we want to pass on to our children are honesty and integrity. We try to lead by example and steer them back on course when they go astray. But there is one thing that almost every child does – and almost every parent worries when they do – so when should we be concerned? This is probably what we’re thinking (but not saying!) when our kids tell us a blatant lie. The fact is, most kids lie at one time or another, no matter what the age. There are reasons for telling fibs at each stage of development and most of the time, it is nothing for us to worry about. While parents should always set the example for their children by being honest themselves, even we should recognize that we tell those little white lies or lies of omission in our daily lives. But it is important to teach our children that telling the truth is always important and explain the difference between lying to protect ourselves and fibbing to spare someone else’s feelings. Toddlers and preschoolers frequently tell us things that aren’t true. The good news is, this is not only completely normal, but can be a sign of creativity and intelligence. In fact, this type of lying can be a sign of good things. “Preschoolers with higher IQ scores are more likely to lie,” says Angela Crossman, Ph.D. Early lying proficiency may also be linked with good social skills in adolescence. While we don’t want to encourage actual lying, telling stories and tall tales at this age is just a sign that children are using their imaginations and exploring cause and effect in their environment. It is usually only a type of play. 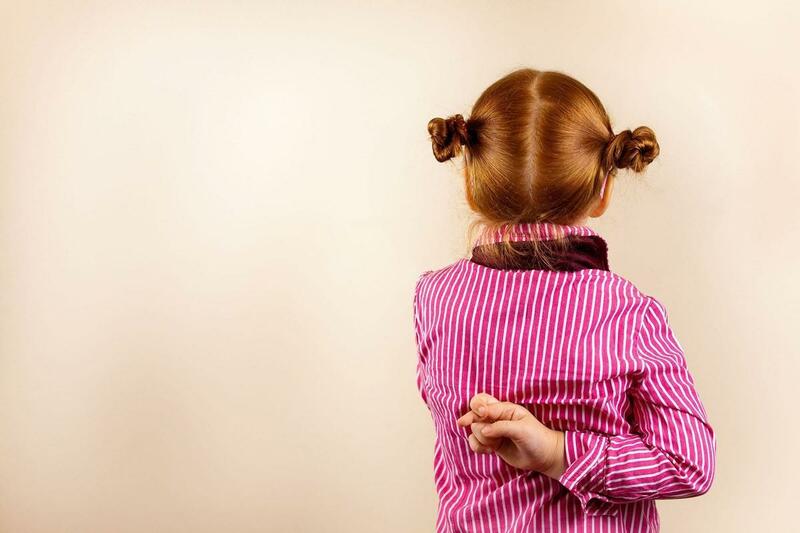 Around age three, kids may begin to tell simple lies to avoid getting into trouble or to get their way. In this case, a calm discussion is the best approach for parents. It is important not to confront them in anger or to cause them to feel embarrassed or ashamed. Ask them why they lied to you about what really happened, what they wanted the result to be, and offer an alternative way they could have approached the situation in simple terms. For preschoolers, as long as they seem to be happy and have realistic relationships with the people closest to them, creating fantasies or trying to force the outcome they desire is common and a “way to process new ideas,” according to Dr. Berger. So here’s where it can get a little tricky – when kids start school and are beginning to really understand the difference between the truth and lying. The social fibs we all tell to spare the feelings of others are called “prosocial” lies, and school-aged children begin to understand that it is less important to be entirely truthful if the lie benefits someone else. Kids this age may say they are responsible for something a sibling or friend did in order to keep them from getting in trouble, even if they must face the consequences themselves. They may also begin to tell bigger lies not so much to protect themselves from getting into trouble, but to avoid disappointing others or feeling embarrassed. For example, they may say they are doing well in a subject at school when they are really struggling with it, and Mom and Dad may only find out there is an issue when report cards come out or they are contacted by the teacher. For these types of lies, it is important to have a discussion with your child and let them know that if they confront problems when they first start with honesty, it will avoid the need to tell drawn-out lies to keep up their story. Kids this age also tell those “Leave It To Beaver” lies – the stories that start with one silly incident they are trying to avoid telling you about and end in a list of little lies that pile up on each other. This is when we must dig deep to understand why they told the lie in the first place and take their feelings into account. And then comes the “tweens” and teens. Whether we like it or not, it is completely normal, in fact necessary, to development for our older kids and teens to start keeping things from us. “Kids who tell everything to their parents at age thirteen or fourteen are not growing up,” says Dr. Brody, as reported by Parenting. With small lies, like saying they did their homework or completed a chore and didn’t, it is best to go over the family rules, discuss responsibility and integrity, and have them complete the task before they do anything else. But if a tween or teen is lying often – especially about things like spending the night at a friend’s house when they are really sneaking out, smoking, drinking, or anything remotely dangerous – it’s time to rein them in by taking their freedoms until they prove they can handle them responsibly. And for chronic lies, especially when kids are endangering themselves or others, seeing a family therapist is in order. Kids this age can be particularly affected by major life changes like a parents’ divorce, a romantic breakup, or a best friend moving away. They are not as apt to discuss their feelings – which is normal as they gain independence – but by holding in emotions, they may turn to negative behaviors. So in the end, it is up to us as parents to approach each fib or lie on a case-by-case basis. The feelings and reasons behind the lie should all be taken into account. And above all, we must lead by example – even if it means keeping a dinner date with a friend when we’re exhausted and just want to stay at home on the couch! Has your young child told a tall tale so outrageous that you couldn’t keep a straight face? Or has your older child ever told a serious lie that could have put them in danger? Leave us your stories.